Thank goodness for mates. Decent people out there prepared to tell me when I screw up—you know who you are—and when Google screws up. It’s not the first time Google has blocked a site of ours through no fault of our own. Something very similar happened about a year and a half ago with this blog. But I had been wondering why our traffic stats had been down for over a week and why the search queries started looking more niche than usual. I originally just blamed the summertime malaise (in the northern hemisphere) though the overall traffic was a lot lower than the same period in June 2011. It turns out that a single GIF on the page from Blogarama, a site Google identified as spreading malicious software, made Chrome go all panicky. I’m not saying it’s wrong of Chrome to be cautious, nor do I suggest Google contact everyone who has content from a reported site on their page. But I wonder if it was overcautious in this case and whether its technique is the right one. I don’t use Chrome, for very good reasons. 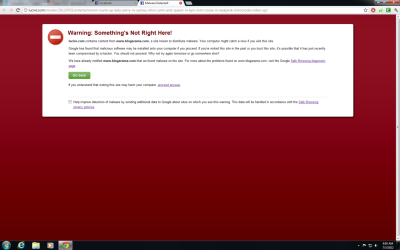 However, on Firefox, with the McAfee plug-in, the content to dangerous sites is blocked, not the whole page. It gives a warning at the top of the browser, saying that potentially malicious content has been blocked. That seems to work all right and it would at least allow people to get to the content they want safely. I will give Google credit on one thing, however: once the Blogarama GIF was removed, it lifted the block within hours.